Victor Trumper scanned the room and noticed with satisfaction that his fellow partners in this venture, Harry Hoyle and James Giltinan, were already there. Over the next hour or so, athletic young men in groups of twos and threes made their way to the hotel, all with that edgy look of people thinking they might have been followed. Happy to be out of the cold, they lit cigars, took some refreshments and made themselves comfortable. Before long, a haze of blue tobacco smoke hovered above the patrons. There were the smells of cooking from the kitchen, whisky and beer from the bar, but overpowering them all was the heady scent of rebellion. The sport of rugby, which only a few weeks before was at its absolute zenith of popularity with a claim to being the most popular sport in Australia, was about to split in two. The men at the secret meeting at Bateman’s Crystal Hotel were players from the ranks of Sydney’s district rugby union clubs. The Sydney district competition had come into being in 1900. Championed by Lewis Abrams, who would earn the moniker of ‘the father of district football’, it was supposed that by representing districts instead of the old social clubs, interest in the game would grow beyond its traditional boundaries. The old clubs such as the Pirates and Wallaroo gave way to the new district entities which were created in raucous civic meetings across Sydney in March 1900. They were referred to simply as football clubs, such was the pre-eminence of rugby at the time. Glebe Football Club, with Abrams as secretary, was the first club formed on 15 March at a meeting at the Glebe Town Hall. Eastern Suburbs Football Club was formed at a meeting at Paddington Town Hall on 22 March. The last of the original eight clubs was South Sydney FC, formed at meeting at the Redfern Town Hall on 26 March 1900. South Sydney would take the field in a curious strip of cardinal and myrtle horizontal bars – colours still worn by South Sydney in the NRL today. 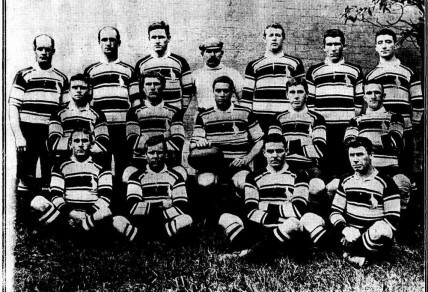 By 1907, under the control of the Metropolitan Rugby Union (MRU), the competition had expanded to 11 teams, and rugby was the only football code in Sydney that could draw crowds of up to 15,000 for club matches. Leaning over the picket fence at Rushcutter’s Bay Oval on 27 April 1907, a supporter of the Eastern Suburbs club had good reason to believe that all was well with the world. It was the opening day of the rugby season and his team were expected to be among the competition front runners. Easts had a strong roster of players who would no doubt feature in the representative matches later in the year. But no player excited the fans more than their diminutive centre three-quarter, Herbert ‘Dally’ Messenger, whose pace, agility and goal kicking prowess had turned him into rugby’s brightest star. The jerseys of the two clubs playing on that first day of the season served as a reminder as to why rugby was king of the football codes in Sydney. Eastern Suburbs had fashioned their jersey on the red white and blue strip of the touring 1899 British team. Their opponents, Sydney FC, were decked out in black, reminiscent of the New Zealand All Blacks. The sport of rugby, which only a few weeks before was at its absolute zenith of popularity, was about to split in two. The sporting public of Sydney craved international competition, something Australian Rules and Association Football could not offer. The one faint cloud on rugby’s horizon was that of professionalism. Under amateur rules, club players had to pay for their uniforms and fares to get to games. The expenses payment of three shillings a day for representative players on tour was miserly. Injured players were not compensated for time off work, which particularly affected men from the working classes. Still, these issues had been around for as long as rugby had been played in Sydney, and there was no reason to suspect this year would be any different. Then, on the Wednesday before the opening round of matches, the Sydney Morning Herald and the Australian Star both published a rehashed article from an English paper, the Manchester Athletic News. It said the Northern Union clubs in England – rugby league clubs – were in talks with promoters for a tour by a New Zealand professional rugby team. The article was a short one and easily missed. Even those who did read it would have probably just shrugged it off, since the focus of the entire rugby community in Australia in 1907 was on one thing and one thing only: the upcoming tour by the New Zealand All Blacks. The unprecedented interest was due to the remarkable tour of the British Isles by New Zealand in 1905. With a record of 35 wins from 36 matches, the tour established New Zealand’s reputation as the leading rugby nation in the world. The All Blacks brought back a big fat profit for the New Zealand Rugby Union. Of this, the players only received the standard three shillings per day allowance. A relatively unknown quantity at the start of the 1905 tour, the Kiwis caused a sensation when they thrashed Devon 55-4 in their opening match. As they continued to rack up victories, the crowds flocked to their games in ever-increasing numbers. By the time they made their way to London to play England at the Crystal Palace, a crowd of 50,000 paying customers turned out to watch. It is estimated that if the non-paying customers standing on the grass slopes surrounding the ground were counted, the crowd could have been as high as 100,000. When the team returned to New Zealand in 1906 they brought with them a new moniker: the term ‘All Blacks.’ They also brought back a big fat profit for the New Zealand Rugby Union. Of this, the players only received the standard three shillings per day allowance. The financial success of the All Blacks tour caught the attention of many observers, including the professional Northern Union in England. Over in New Zealand, it also made an impression on one Albert Baskerville, a 24-year-old postal clerk and handy club rugby player from Wellington. Baskerville had followed the progress of the tour and was aware of the claims arguing that New Zealand had not beaten the best of England since they hadn’t played against any Northern Union teams. One day while at work, a colleague dropped a British newspaper on the floor. Baskerville picked it up and read a report about a crowd of 40,000 attending a Northern Union match. This inspired the postal clerk to come up with the idea of taking a New Zealand team to England in the latter half of 1907, with the players taking a share of the profits. The Northern Union proved to be a receptive audience to the notion. Baskerville began to sound out New Zealand players for the proposed tour. To help select the team he was able to secure the services of George Smith, a leading player on the All Blacks’ 1905 tour. However, Baskerville’s activities soon came to the attention of New Zealand rugby authorities and he was banned from any involvement with the game. New Zealand cabled the England Rugby Union warning them about a possible professional tour, and players in the North Island versus South Island trial match were required to sign statutory declarations saying they wouldn’t take part in any professional matches. In Sydney, the New South Wales Rugby Union (NSWRU) publicly backed New Zealand’s stance. Baskerville might have been banned from setting foot on a rugby ground but that didn’t stop him from watching the North Island versus South Island match. He saw the action from his perch in an apple tree in the front yard of a friend’s house. Despite the efforts of the New Zealand Rugby Union, intermittent cable reports from Wellington appeared in the Sydney press indicating that progress was being made on the professional tour. On June 1, 1907, it was announced that the Northern Union had finalised arrangements for a 27-match tour by New Zealand. Towards the end of June came another cable that raised the eyebrows of Sydney rugby supporters, which suggested that an Australian player may be recruited to strengthen the New Zealand back line. What Australian player would a New Zealand team possibly want? Messenger? In Sydney’s offices, factory floors, shops, trams and bars, it seemed every conversation was about the upcoming All Black tour of Australia. On Thursday 11 July 1907, the New Zealanders arrived in Sydney aboard the steamer Warrimoo after a rough voyage. At their base at the Oxford Hotel in King Street, the manager of the All Blacks, Edgar Wylie, told a reporter from the Evening News that he was quietly confident of winning the upcoming match against New South Wales. “As far as I know you can give that an absolute denial,” replied Wylie. The Sydney public were having no such issues becoming infected. They were counting down the hours to the first game. The weather on Saturday, July 13, for the opening tour match between New Zealand and New South Wales was perfect for rugby. People began to arrive at the Sydney Cricket Ground just after mid-day for the 3.00pm kickoff. In Sydney, where people usually turned up at the last minute, this was unheard of. Before long it was impossible to get on a tram such was the rush of people going to the game. By the time the players ran on to the field, spectators had taken up every vantage point, including some on the roof of the grandstand. New South Wales started the game well, taking an early three-point lead. When the Governor-General, Lord Northcote, arrived fashionably late, the game was halted while the players went across to the pavilion to give him three cheers. New Zealand came back to record a hard fought 11-5 victory. Rugby authorities were gobsmacked by the turnout. The crowd of 52,000 was the largest to attend a football match of any code in Australia, surpassing the previous mark of 45,000 at the VFL premiership decider in Melbourne in 1906. A second game on Wednesday, July 17, was watched by a midweek record crowd of 23,000. This time, NSW defeated a depleted New Zealand team 14-0. On Saturday, July 20, New Zealand played Australia in the first Test match. Messenger was injured and didn’t take part. Queensland players were included in the team, which took the field in jerseys featuring maroon and blue horizontal bars with a kangaroo emblem over the left breast. New Zealand, back to full strength, scored within three minutes and won the match easily, 26 points to 6. Pundits from New South Wales blamed the lack of cohesion on the inclusion of the Queensland players. Another huge crowd of 49,000 watched the game although at least two newspapers claimed the figure was closer to 55,000. Rugby now boasted the two highest football attendances in Australia and could genuinely claim to be the most popular sport in the country. The exhilaration of rugby fans was tempered somewhat by the release of another cable from Wellington on the day of the Test match. It listed the names of the players on the professional tour. Six of the current All-Blacks were on it. The tour now moved north to Queensland, and New Zealand took the overnight train to Brisbane. When it stopped briefly at Newcastle, a reporter asked Wylie about the names on the list. Wylie “was not disposed to talk of it.” Perhaps he just said something that wasn’t printable. The All-Blacks defeated Queensland in two matches before facing Australia in the second Test at the Gabba. The match drew a Brisbane record crowd of 20,000. Australia led 5-0 at halftime and the crowd were in high spirits. When a dog dashed across the field with a mounted trooper in hot pursuit, it was greeted by laughter and a chorus of whistles from the crowd, and when a New Zealand player dropped an easy pass a spectator called out, “‘E ain’t got enough brains to make ‘is ‘ed ache.” It’s not known what that spectator said after New Zealand’s inspired second half performance gave them a 14-5 victory. But the game itself, indeed the whole weekend, had been overshadowed by events off the field, which began with another cable from Wellington. The cable, released on the eve of the Brisbane Test, announced that the professional New Zealand team would now play three matches in Sydney against local players. To the average rugby fan, this was startling news. What had previously been viewed as a New Zealand problem had now become an Australian one. That secret movement was headed by an Australian entrepreneur and sometime cricket umpire, James Giltinan. Back in 1906, the Auckland City rugby club had played a series of matches in Sydney. One of their players was George Smith, recently returned from the 1905 All Black tour of the United Kingdom. Smith had been impressed with what he had seen of the professional Northern Union game and he discussed professional rugby with Giltinan while in Sydney. By 1907, relations between the players and the game’s administrators had worsened. Many players felt the three shillings a day allowance was poor reward considering the massive profits the All Blacks matches had made for the NSWRU. 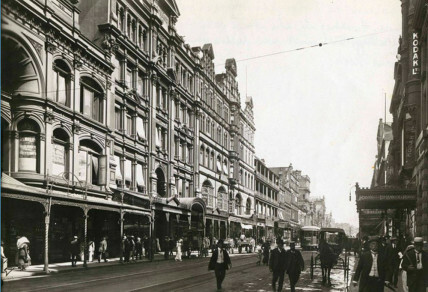 In meetings with senior players in Victor Trumper’s sports store in the city, Giltinan sensed that Sydney, with its large percentage of players from working class backgrounds, was ripe for professional rugby. He invited Baskerville to bring his New Zealand professional team to play three matches against a team from New South Wales as a warm up to the tour of England. Baskerville agreed. On Monday, August 5, just five days before the final Test, Messenger was once more rumoured to have signed on to join the New Zealand professionals on their tour of the United Kingdom. Messenger again denied the rumour. Then on Tuesday all hell broke loose. Lewis Abrams launched a scathing attack on the MRU, blaming their inflexibility with the amateur rules for the crisis. This was the first time someone from inside the game had attacked the ruling body. The MRU called an emergency meeting a day later that cleared all players of any involvement in professionalism. If they weren’t ignoring the problem they were completely out of touch; the rebel players held their secret meeting at Bateman’s Crystal Hotel to establish professional rugby in Sydney the following day. On Friday, the day before the final Test, the Australian selectors sat down to pick their team. With the series already decided, New South Wales officials wanted to field a NSW team since the New Zealand/NSW series was tied at one game each. The Queensland Rugby Union (QRU) would not agree. As the match was in Sydney, the NSW delegate had the casting vote. Surprising to nobody, all players selected came from New South Wales. The QRU was incensed. The NSWRU had got their northern counterparts offside at a time they needed to be making friends, not enemies. The All Blacks in Sydney had a restful day on the Friday. For the evening’s entertainment, they cancelled their original appointment and attended a production of The Great Awakening at the Theatre Royal. It seems more than a little coincidental that the cancelled function was to be hosted by the Glebe club whose secretary had criticised the MRU earlier in the week. Across the Tasman on that same Friday, a ship slipped anchor in Wellington harbour carrying the bulk of the New Zealand professional team. Incidentally, the ship was the Warrimoo, the same one that had borne the amateur All Blacks to Australia just over a month before. As the Warrimoo headed directly into the eye of the rugby storm forming over Sydney, a mole from the secret meeting walked into the offices of the Australian Star. 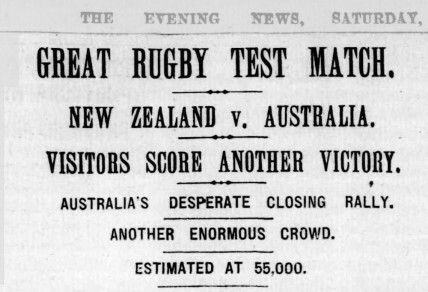 In the last Test ever played where only one code of rugby existed, Australia had matched the All Blacks. The next day, Saturday 10 August, both the Australian Star and the Sydney Morning Herald revealed the details of Thursday’s meeting at Bateman’s Hotel. For rugby fans hoping the issue would just go away, the news was devastating. Fifty players had attended, including five club captains, and a further 100 more were supposed to have supported the move. Eight of the eleven clubs were represented. A new body, the NSW Rugby Football League had been formed. Players had signed a declaration that they would play against the professional New Zealand team if selected, in three games on the 17th, 21st and 24th of August. All that was missing from the reports were the names of the players. At the SCG, rumours about professionalism spooked the 30,000 fans at the Test. For more than an hour before kick-off, people speculated who would play for Australia, or if the match would even go ahead. At least two instances of fisticuffs broke out on the hill between amateur and professional rugby supporters. To the crowd’s relief, all the selected players took their places on the field. Australia started brilliantly, going into the break leading 5-0. Once again, New Zealand rallied in the second half but could only manage to draw the game 5-5. All sporting eyes now focused on the open meeting to be held the following Monday at Bateman’s Hotel where the New South Wales professional team would be announced. 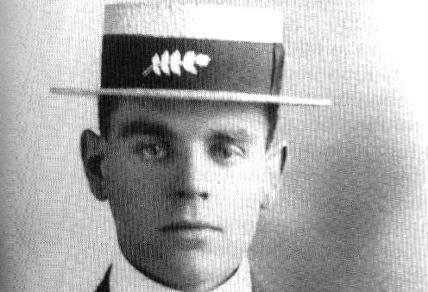 Alf Dobbs, currently on a country tour with the Balmain club, desperately wanted to attend the meeting. The club’s manager refused to give him his return train ticket. In Sydney, the club secretary wired the team, calling off the tour. The MRU advised the manager to continue and Dobbs had to make his own way back. Relations between the professionals and amateurs were degenerating. If this was to be a civil war in Australian rugby, then a key battle would be for the signature of rugby’s biggest name, Herbert Messenger. Which way would he go? Enter the kingmaker, Victor Trumper. 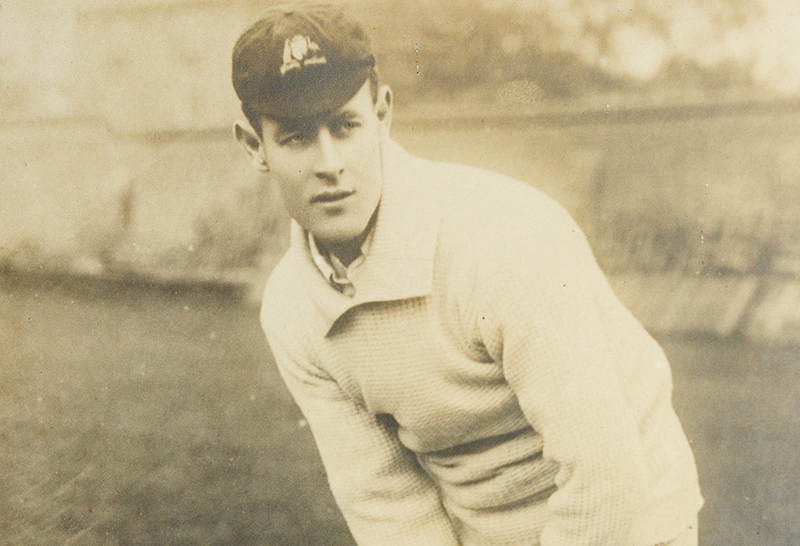 As the leading cricketer of the age, Trumper was a national sporting hero. He had done well out of the game. Cricketers received much healthier expenses than footballers and shared in the very tidy profits from overseas tours. Like Messenger, Trumper lived in Sydney’s Eastern Suburbs. At 29 years of age, he was five years Messenger’s senior, and the two were personal friends. It is hard to know exactly what role Trumper had in the players’ decisions to turn professional, but he certainly gave the movement some legitimacy. There is no doubt that Messenger would have closely listened to Trumper’s advice. “Get yer Papers! Penny for the Herald! Professional football team announced!” shouted the paper boy who had jumped on the footboard of the city-bound tram. Our Eastern Suburbs supporter fished a penny from his pocket and gave it to the boy who promptly hopped off the tram at the next stop with the oaths from the conductor ringing in his ears. The supporter flicked through broadsheet and stopped at page seven. Under the heading ‘Professional Football’ he ran his finger down the list of names – Messenger was in the team! There was now a stand-off between the professionals and the rugby union. The professionals, in their apparent desire for riches, were dubbed ‘All Golds’ by sections of the Sydney press as opposed to the ‘Lillywhites’ of the amateur game. Rugby union officials were convinced the professional movement was doomed and would soon run out of steam. Letters extolling the virtues of both sides appeared in the press. When interviewed, the New South Wales Attorney-General, Mr Wade, had some interesting thoughts to offer. He had played rugby at a senior level in England and had some sympathies for the players. Reporters were able to catch some of the mood of the Union officials: “if we give them enough rope they’ll hang themselves,” said one. 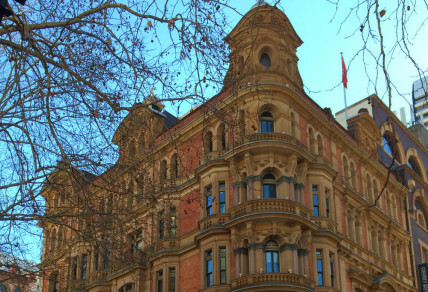 On Thursday, August 13, a lavish reception was given to the New South Wales and New Zealand professional teams at the Sydney Town Hall. A standing ovation lasting several minutes was given to the New Zealanders. The New South Wales players then came out to more cheering, with an extra cheer reserved for Messenger. The reception concluded with a martial arts display by a Professor Stephenson and a rousing rendition of Auld Lang Syne. While Professor Stephenson was entertaining the New Zealanders with his ju-jitsu moves, reporters had also gathered across the city in Bligh Street where the MRU were holding a crisis meeting. The only news they could report was that the MRU didn’t have the delegation from the NSWRU to take any action against the professionals. The MRU were playing a waiting game. Still, the reporters were able to catch some of the mood of the Union officials: “if we give them enough rope they’ll hang themselves,” said one. The first match of the professional rugby series between New South Wales and New Zealand took place on Saturday, August 17, 1907, at the Sydney Showground. In a rather bizarre twist, the curtain raiser was a premiership game of Australian rules football between Newtown and Sydney. New South Wales took the field in a darker shade of blue than usual and the match was billed as the ‘All Blacks versus the All Blues.’ In what was essentially the first game of rugby league played in Australia, albeit with 15 players a side and played under rugby union rules, New Zealand won the match 12 points to 8. Far more important than the result were the gate takings from the bumper crowd of 20,000. New Zealand won the second match on the Wednesday and the third on the following Saturday. And although the crowds for the last two matches were disappointing, the New Zealanders were able to begin their tour of Great Britain with a tidy sum in the bank. Despite his repeated denials, Messenger joined the New Zealanders on the tour. In a last desperate move, Lewis Abrams, the one-time ‘father of district football’, put forward a proposal to the MRU to dramatically increase the players’ allowance, in effect matching the conditions of the professionals. In a fiery meeting, the proposal was thrown out on the grounds that it would have meant embracing professionalism and causing a break with the English Rugby Union. Rugby could now be rid of the stain of professionalism and revert to strict amateur ideals. The final chance for reconciliation had passed. There was still life in rugby union, however. In the week leading up to the premiership final, mannequins dressed in the blue and gold colours of Sydney University and the maroon of Glebe were set up in the display windows of the Grace Brothers store on Broadway. Scores of passers-by jostled each other to get a good view. If our Eastern Suburbs supporter walked by he would have shaken his head in disgust. His team had lost eight players to the professionals and had been knocked out of the premiership by Glebe the week before. On Saturday 31 August 1907, a crowd of 20,000 turned out at the Sydney Cricket Ground to watch Glebe beat Sydney University 13-0 to win the last premiership before the split. The rebels had a nervous wait over the summer. The rugby authorities had successfully lobbied the local Australian rules and association football bodies to apply the same bans against professionals, so there was no chance of the players shifting to another sport. If the new league could not get off the ground, the players’ sporting careers were over. They needn’t have worried. In scenes reminiscent of 1900, civic meetings were held in Sydney and Newcastle in the early months of 1908 to create the brand new professional football clubs. The first club formed was Glebe at a meeting in the Glebe Town Hall on the 9 January 1908. Eight clubs would take to the field on the first week of the season, for the most part representing the same districts and wearing the same colours as the rugby union clubs. To the fans, not much had changed other than having the choice between watching a new game catering to the working classes or the old game that was even more amateur than before. At 2 pm on Monday 20 April 1908, the first ball was kicked in the inaugural season of professional rugby in Australia. To the rebel players, the familiar sound of boot striking leather must have brought with it a sense of relief. To the founders of the new sport of rugby league, it sounded distinctly like a heartbeat. Sydney rugby was always going to be receptive to professionalism. But it was Baskerville’s tour of England, piggy-backing on the success of the 1905 All Blacks, which was the catalyst for the creation of rugby league in Australia in 1907. The rigid deadlines imposed by Baskerville’s tour drew the ‘secret movement’ of would-be professionals in Australia out into the open and forced them to organise in July and August 1907. So tight were the deadlines that the ship taking the tourists to England had already left Sydney when the final All Blacks versus All Blues game was played. The players had to catch the overnight express train to Melbourne to connect with the ship in time. For Albert Baskerville, the driving force behind the professional New Zealand team, the tour was at once a triumph and a tragedy. The tour made a fortune for the players, but the one-time postal clerk turned football entrepreneur would return home in a coffin. On the return journey from the United Kingdom, the professional New Zealanders played a series of matches in Australia. In Brisbane, Baskerville contracted pneumonia and died on 20 May 1908. His body was then taken to Sydney and, in a rare show of unity, flags at all rugby league and rugby union venues were flown at half-mast on the day that the ship carrying Baskerville’s coffin left Sydney for Wellington. Image Credit: All images are Copyright Paul Nicholls, unless otherwise noted.